Aggregating data in a Dashboard allows you to display the most important data for your business simply and immediately. Dashboards compare, aggregate and analyse key information according to your needs and priorities, displaying the main Key Performance Indicators (KPIs) for your business activities. 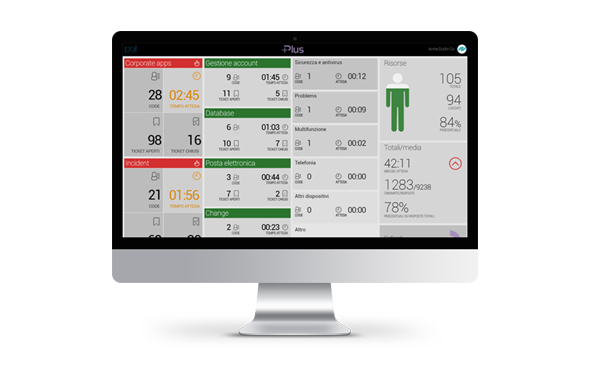 Plus creates and personalises your Dashboards according to information on the business processes you wish to monitor and measure in real time. Get more value from your activities and your business through the Plus solution: using the immediate and intuitive Dashboard facility, view and consult your performance, results and business productivity levels in relation to objectives set. Enjoy instant access to strategic KPIs you can consult and analyse to monitor your business performance. Intuitively create and personalise how the Dashboards display data according to your business needs and priorities.